The family of SRA Denny W. Madory has asked the PGR to stand a flag line at his Memorial Service to be held on 25 February 2019 at the Elevate Church, located at 210 S. Broadway, Moore, Ok. at 1 pm. Mandatory Briefing: 12:00. Riders must attend mandatory briefing if riding in the accompaniment. Riders will stand a flag line for incoming family and friends. A respect line will be formed as the hero is brought to the Coach. Riders will accompany the hero, family and friends to IOOF Cemetery, located at 1913 N. Porter Ave, Norman,Ok. Weather: 58 degrees, breezy. Please hydrate before and during the mission. Mission Complete: 25 February 2019- SRA Denny W. Madory- USAF, War on Terror Veteran, Moore/Norman,Ok. 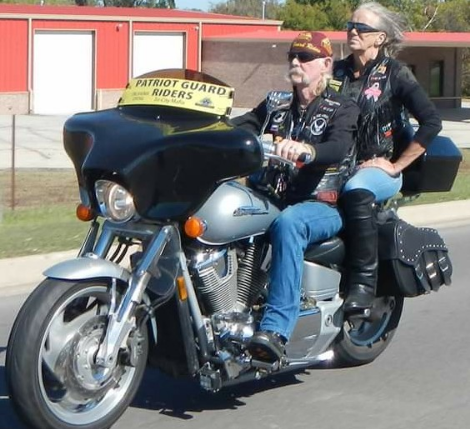 On Monday 25 February, 2019 there were 20 Patriot Guard Riders on 16 bikes and 2 cages who attended the mission to Honor the Military Service of USAF War on Terror Veteran SRA Denny W. Madory at the Elevate Church in Moore, Ok.. The area surrounding the Church was staked, and the American Flag Flew proudly in the stiff breeze as family and friends arrived. The briefing was held, followed by a moment of silence for the Blue, Silver and Gold Star families, POWs and MIAs. A prayer asking comfort for the grieving family, a safe mission and protection for our military personnel engaged in the Global War on Terror was also said. The PGR then stood the Flag Line, with the Air Force Flag and American Flag held at the entry door, and manned the doors as family and friends arrived for the service. When the service started, PGR members returned the flags to the flag vehicle. At the conclusion of the service, PGR members stood a Respect Line as the Hero was moved from the Church to the Coach. With the able assistance of the Moore Police Dept., the PGR accompanied the Hero, family and friends to IOOF Cemetery in Norman, which had been staked and flagged prior to the arrival of the accompaniment, and stood another Respect Line as the Hero was was moved from the Coach to the grave site. The Air Force Honor Guard folded the flag, and Taps was played. The Honor Guard then presented the flag to the Hero’s wife. The PGR Plaque was read and presented to Hero’s wife.The PGR Invocation was then read and presented to the Hero’s wife. A copy of the Invocation, signed by the attending PGR members, and printed condolences were also presented to the Hero’s wife. The RCIC thanked the family for inviting us to come and Honor the Military Service of their loved one before a final salute was rendered by members. 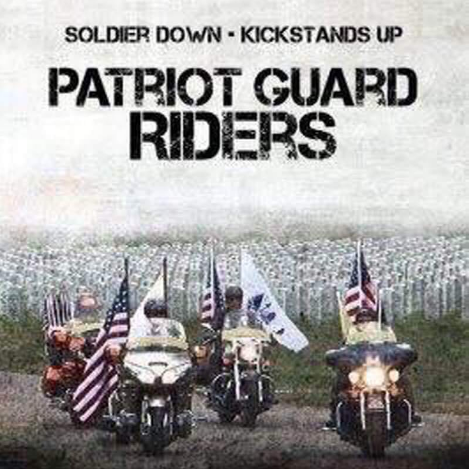 Thank You to all my fellow Patriot Guard Riders for attending this mission. Your presence made a difference to this family. A special Thank You to the efforts of the Moore Police Dept. for their assistance. Most of all, Thank You SRA Denny W. Madory, for your service to this great nation. Rest In Peace Sir, your mission is complete and you will not be forgotten. I’m praying for the family.